Software error causes Post and Go printing to be inverted. I don't normally blog at the weekend but thought I should share with you a Post and Go error that I received on a letter this morning. At first sight it seems easy to explain - the reel of stamps was mounted in the machine the wrong way - but that actually wouldn't produce this invert unless the whole reel of stamps was wound the wrong way, because the feed would present the back of the strip to the printer. The enclosed letter explained: A software fault in the NCR Self-Service Kiosk, which occurred bizarrely only at Sydenham BO, caused the stamps to be to be inverted on a normally-mounted reel of stamps. On a collectors set of 6, the 1st class stamp was printed first, followed by the 1st Large, Euro 20/World 10, etc. Apparently despite this the stamps are still usable as printed, so the Branch Manager was told to continue to use the machine (presumably because of the Christmas post pressures), and it took 8 engineer visits (yes, eight) to put this right. And so the MA16 Poppy, MA14 Machin, and Ladybirds are also currently available on eBay with this error - which is much more than 'an example of each'. I'm reminded that when a roll of stamps is replaced in a PandG or SSK machine, either due to a fault in the machine or when new designs are issued, the old roll is often dropped into a storage area within the machine - I've seen that myself and I and my customers have benefited from it. If the 'part roll' - let's say they are Machins - has sufficient stamps on it to make it worthwhile using it it may be reloaded when the temporary (say Winter) stamps are removed. If there are too few to use they ought to be destroyed of course. Back in 2014 new rates of Europe 60g and Worldwide 60g were introduced when rates changed. Many of these were able to be produced on stamps which were thought to be long out of use. We reported the following from around the country: All three water life, all three farm animals, union flag, Machin, spring flowers, robin, and lastly Birds 2, 3 and 4. Obviously these were not all from the same branch but several different branches had some very old stock, and boosted their turnover as a result. Most branches only had two designs active, but could produce others if asked. This is unlikely to happen again, not in the near future. But errors can occur - albeit not many on NCR SSK machines. But all of us have the opportunity to pop in to SSK branches and buy a stamp - if it turns out there is an error, then buy more. Of course if you not are a regular visitor you may not be able to persuade the staff to add something different, but if you cultivate your sources by being a regular visitor and finding friendly staff, then you can achieve more - a fact that applies to ordinary post office branches and buying booklets or other stamps as well. And don't begrudge others their good fortune and the work they put into sourcing different stamps. Without these people I wouldn't have anywhere near as much to report! "I'm the software designer and lead developer at NCR for the Post Office self-service machines. My first inclination is usually to assume that our software is at fault until proven otherwise, but in this case it seems quite unlikely. It is possible to generate this kind of reversal if the media have been removed from the roll and fed into the printer the wrong way, which I suppose could happen with a left-over roll." "Invert the image and the stamps will be correct, and the printing will be in the correct order, ie the first stamp to be dispensed in a Collector's Strip is the 1st class (stamp number 43 on the Machin). 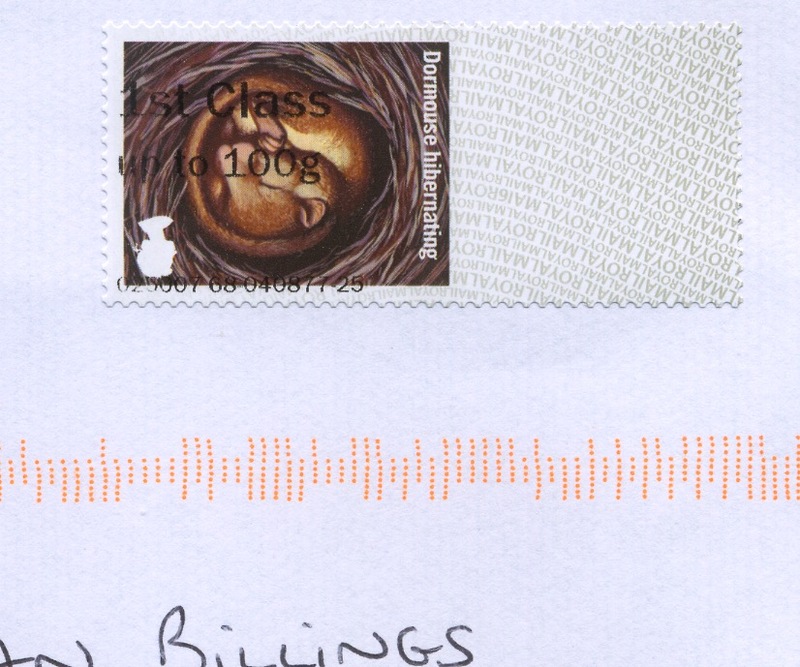 The second stamp is the 1st Large - stamp number 44, and so on to the Worldwide 100g, stamp number 48. So the printing is in the right order on upright stamps, but the print is inverted appearing at the right of the stamp instead of the left. 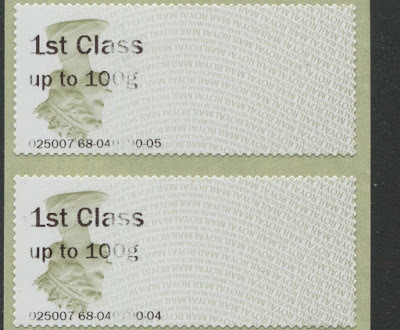 The printing on each stamp *must* have been printed with the datsstring printed first, and the top line of '1st class' printed last." As an aid to understanding what has happened here is the Machin strip up the right way - see right. The top stamp is number 43, the next is 44, then 45, and so on. Seriously? Less than three weeks before Christmas and someone in the post office has the time to reload the kiosks multiple times on the whim of a collector? And why would anybody want these purely artificial creations? Are they any more than curiosities? Of course if the 'collector' buys enough then the machine would need to be reloaded - and why not with something different if he then bought all of those? It seems there are customers aplenty - probably in Europe - willing to pay £50 for less than £8-worth of stamps. I suppose it makes sense if the collector used up the whole roll, though you implied otherwise when you said the collector asked for different stamps "just to provide an example of each". How much would it cost, and how long would it take, to buy a whole roll of Post and Go stamps? Agreed; that was an assumption written before I realised how many were on eBay. I *would* have asked for others to be loaded, but not to use whole reels. I've edited the blog. It always appears to be the same seller that has these 'rare' errors on eBay. A quick check of the sellers contact details finds that they share the same name as someone on Linked-In who works for Royal Mail finance in London. Perhaps this is just coincidence, who knows? Maybe this seller is one of just a few of us who travel around visiting lots of machines week after week in the search of such items! The more Post Offices you visit the more chance there is of finding errors!! I wonder how many different machines the writer of the above has been to in the last day, week, month or year??? If the seller you mentioned has keys and is able to influence staff as you put it, why are a lot of the errors and varieties from different machines and locations? Perhaps he works a bit harder on his hobby than others out there who just sit back and want 'everything on a plate' given to them! It's great when you find an error or variety, but it doesn't sound like the writer has ever experienced that thrill!! It seems you have very accommodating staff in your post offices. I cannot imagine it happening here in the US, at least in a busy post office and especially in December. I'm sure that the "software error" is no doubt true in this case but, even if I collected Post and Go, I'd wonder if someone could produce this kind of item for themselves. My problem is that, judging by Ebay adverts, there have always seemed to be plenty of blank P&G labels in circulation. These blank labels seem to provide an opportunity. This appears to require assistance from the person loading the machine, but he may have thought that you were just removing a few blank labels for your collection. Skepticism is healthy - in fact it often provides a reality check! The only flaw in your argument is that (a) nobody should have access to the blank rolls but the staff; (b) they should not (but some clearly do) allow collectors to take blank labels or test strips that you can also see on eBay. It is nothing to do with feeding inverted stamps. The stamps should be viewed with the Queen's head (in the case of Machin)the right way up. Then you will see that the text is inverted with the lowest transaction number at the top. If the stamps were inverted (as with the Ludgate Circus Wincor error)the highest transaction number would be at the top when viewed with the Queen's head the right way up. The Sydenham error was genuine. I'm the software designer and lead developer at NCR for the Post Office self-service machines. My first inclination is usually to assume that our software is at fault until proven otherwise, but in this case it seems quite unlikely. It is possible to generate this kind of reversal if the media have been removed from the roll and fed into the printer the wrong way, which I suppose could happen with a left-over roll. Interesting that you were not already aware of this given that engineers were called on 8 occasions before it was fixed. Perhaps it would have been clearer if I had inverted one of the images (I'll try to do that after adding this comment). Invert the image and the stamps will be correct, and the printing will be in the correct order, ie the first stamp to be dispensed in a Collector's Strip is the 1st class (stamp number 43 on the Machin). The second stamp is the 1st Large - stamp number 44, and so on to the Worldwide 100g, stamp number 48. So the printing is in the right order on upright stamps, but the print is inverted appearing at the right of the stamp instead of the left. 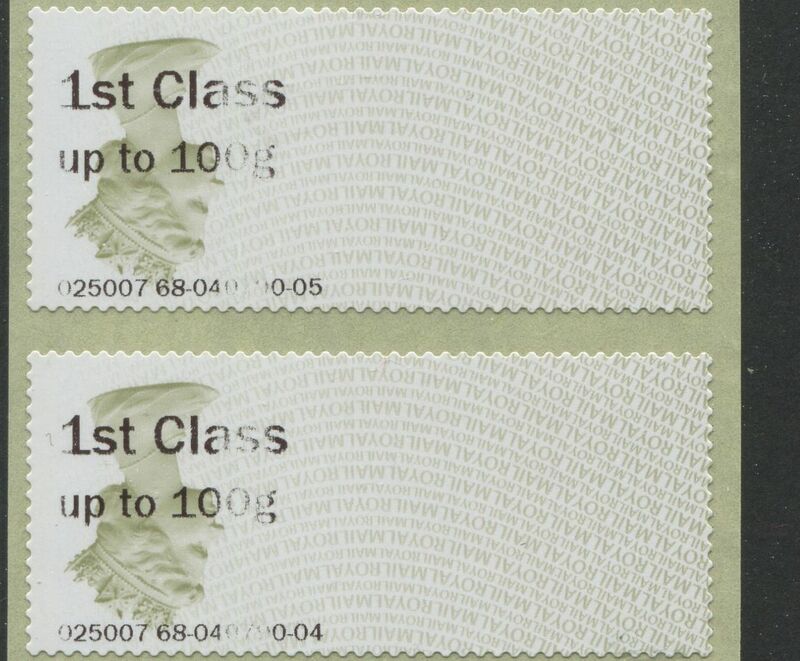 The printing on each stamp *must* have been printed with the datsstring printed first, and the top line of '1st class' printed last. Either the print command was wrong, or the print-head was inverted: I reckon the former, but given that the 2nd class rolls were OK, it is indeed a puzzle. Thanks, Ian. I became a fan of this site shortly after I started working on this project back in 2013, and I've been a regular (albeit quiet) visitor since then. Even though I typically do hear about issues like this through the usual channels (and this one has been reported), it's very helpful to hear from users such as yourselves who have such a keen eye for detail. I just popped out to the lab here and re-created the issue (I can send a photo, if you'd like). The way that it can be done is by tearing off a strip of blank media, rotating it 180 degrees while keeping it face-up, and feeding the media into the printer that way. It could also be done if the roll were nearly empty and the strip of blank stamps was unwound and fed backwards in a similar fashion. It's not impossible for a software fault to cause the same problem, but without getting too far into the inner working of the system, it would require a fairly unlikely set of failures for that to happen. It's certainly not impossible, but I'm more inclined to think that an unrolled strip of media was somehow fed through from the wrong end. Okay, the penny just dropped. I read your response more closely and looked again at the collector's strip. Indeed, you are right. I know of no way that could happen unless each individual stamp image were somehow rotated. Neither of those was 'sold' very well on eBay with minimal description which didn't even mention the error. Neither is now available on eBay. Why are people surprised about vending machine discrepancies. Because on these machines errors are scarce. I wouldn't class these as "errors" as such at all, not in the philatelic sense anyway. When you finish off part-printed stamps "in situ" using what is effectively a computer printer, you are bound to be able to create all sorts of nonsense out of it sooner or later, whether by luck or design. Caveat Emptor. It's a software error - and there have been several of them in the past but mostly on IAR machines. I have some difficulty with your use of the words 'you are bound to be able to create...'. Rob, you are quite right. There is going to be a lot of people upset when they are offered 50% face in the future for all this material. A picture explains it better, software error on the left, paper feed error on the right top stamps are different, with the paper error the top stamp is still 1st class and lower number. The software error top stamp is Worldwide 100 grams which never happens, this also did not happen with Shepherds Bush 2nd class, that was a paper feed error but i think on the whole roll and not part of. So if the software engineer says it probably isn't a software error and the stamps most likely have been loaded the wrong way round then why would a trained PO operative deliberately put the other versions in the wrong way round? Ian is right; there was an error. It turned out to be an issue with the printer configuration (they're actually designed to print either way, and a couple came with the wrong setting enabled). Both, it appears,from the same PO and that its the same seller again! Software errors aside, its still seems a coincidence perhaps I'm just too cynical? And my comment in red in the blog itself: other people work at sourcing different post and go much harder than I do now, but on the introduction of the 60g stamps I sourced three from Norwich, and had other people sourcing for me and my customers in Leeds, Glasgow, and elsewhere.